Peter Morin has won a Hnatyshyn Foundation award for outstanding achievement as an artist. BRANDON, Man. — Brandon University (BU) professor Peter Morin has won a major Canadian visual arts award. Morin is this year’s recipient of the $25,000 Hnatyshyn Foundation Mid-Career Award for Outstanding Achievement as an Artist. 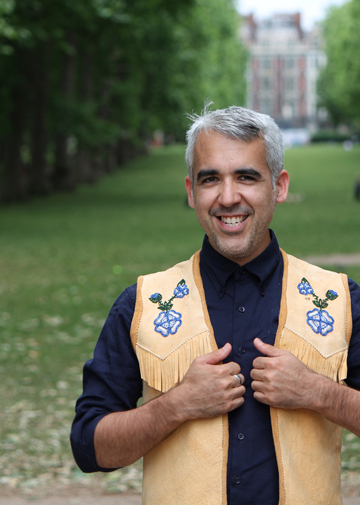 A member of British Columbia’s Tahltan Nation, Morin produces multi-disciplinary works, often including performance interventions, as he looks at the effect of Western colonialism on traditional Indigenous practices. Morin joins respected artists, including Pascal Grandmaison and Kent Monkman, as winners of the Outstanding Achievement award. He was also thrilled to be recognized alongside his former colleague Tania Willard, who won the Award for Curatorial Excellence in Contemporary Art. An Assistant Professor in the Department of Visual and Aboriginal Art, Morin has taken part in group and solo exhibitions, and has curated several exhibitions as well. His work as an educator was also cited by the Hnatyshyn Foundation. “Peter Morin interventions and projects take us outside our own experience and into a new space of humour and wisdom,” said Glenn Alteen, who was part of the jury that chose the recipients. The Hnatyshyn Foundation is a private charity that delivers more than $180,000 each year to artists and curators. “Morin was also one of the recipients of a four-year, $270,000 Insight Grant this year from the Social Sciences and Humanities Research Council for the project “Crossing Media, Crossing Canada: Performing the Land We Are.” Led by Ashok Mathur of the University of British Columbia Okanagan Campus, the project examines how new methods and technology influence the creative process.